You are currently browsing the tag archive for the ‘black odyssey’ tag. 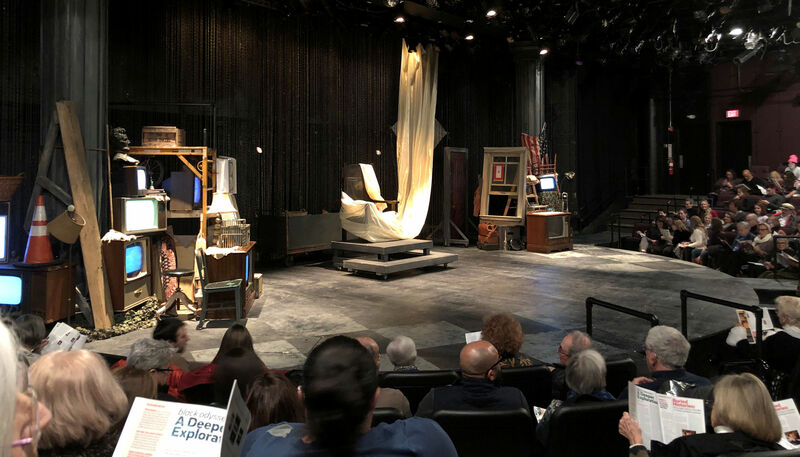 Stage set for the opening scene of black odyssey, as the audience waits for the show to begin. While I was in Providence, Will and I attended a show at Trinity Repertory Company, just a few blocks from where I stayed at the Biltmore hotel. 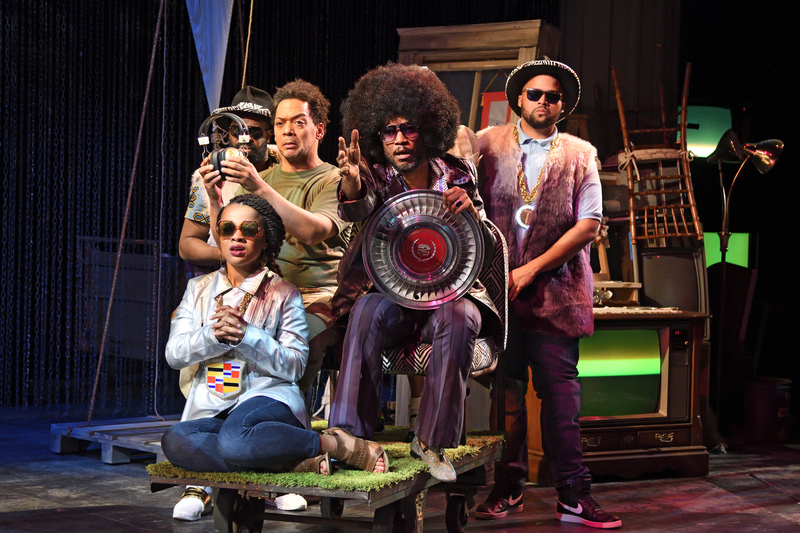 Black odyssey plays from January 3 through February 3, and if you get a chance to go, you must do it! This is not Homer’s classical story of The Odyssey, but a political and historical piece that resonates when viewed against the backdrop of Homer’s work. The audience finds out pretty soon that the gods are toying with the humans. Paw Sidin (Poseidon) sucking on a knight chess piece reminded me of the scene in that 1981 movie Clash of the Titans, when the gods loomed over tiny clay models of humans. In the movie, when the gods damaged the clay models, the actual people suffered. As Paw Sidin sucked on the knight, the human was drowning in the ocean. Ulysses (Odysseus) was returning from duty in Afghanistan to his home in Oakland, with the weight of a murder on his soul. Paw Sidin was angry beause the man Ulysses killed in Afghanistan was his son. He knocked Ulysses into the water, vowing vengeance. Ulysses is barely kept alive by Aunt Tina (Athena) who begs her father Deus (Zeus) to spare him because he is her nephew. The play is the story of the gods battling in a game of chess over how to resolve this dispute. The stage is painted as a chess board, so that you never forget that theme. Costumes, shoes, and songs wowed us. On the far right and left of the stage sit piles of old television sets that at first didn’t make much sense to me as a prop, and then became integral. The sets are different sizes, one tipped onto its side, and each displays a different scene, so the message isn’t always obvious. When Ulysses is drowning, for example, the scenes were all of rough ocean waters – that was pretty obvious. 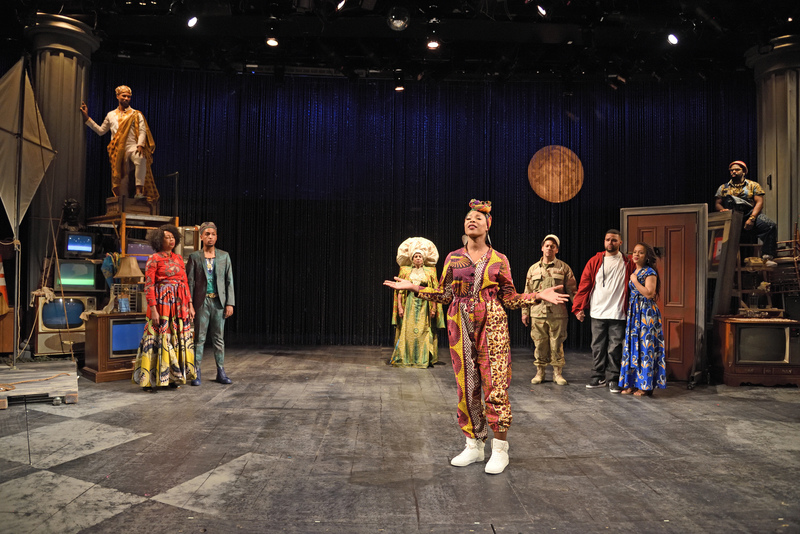 But at other times during the show, there are scenes from Oakland city, news broadcasts of historical events, or other evocative imagery including contemporary events like flooding during Hurricane Katrina and recognizable police camera footage, that help the audience put pieces together. I’m one of those people that needs help in a story. I’m not very good at inferences from imagery in art, in acting, or in words. I’m oblivious to song lyrics. The screens brought it home for me. I read The Odyssey a few years ago. A lot of you have read it, and you might remember that Odysseus was just trying to get home to his wife. The trials he had to endure crossed the line into ridiculousness and are only believable in the context of gods. He is captured by a Cyclops, the crew is turned into pigs, they are subjected to Sirens, Odysseus is trapped on an island and when he gets away his raft is destroyed. Come on! 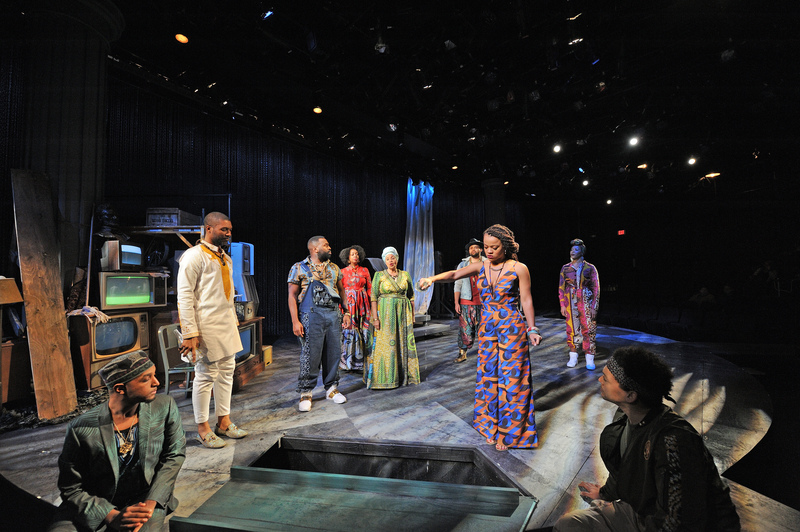 Marcus Gardley wrote the play black odyssey based on The Odyssey to tell the story of a black man in America. In the play, Ulysses can’t find his way back to his wife and son for 16 years (turns out she was pregnant when he was shipped to the desert to fight). So many terrible things challenge them. The trials they all endure while he battles his demons and his wife raises their boy alone, cross the line into ridiculousness. Their story would only be believable if set in the context of, well, being a black family in America. Ouch. 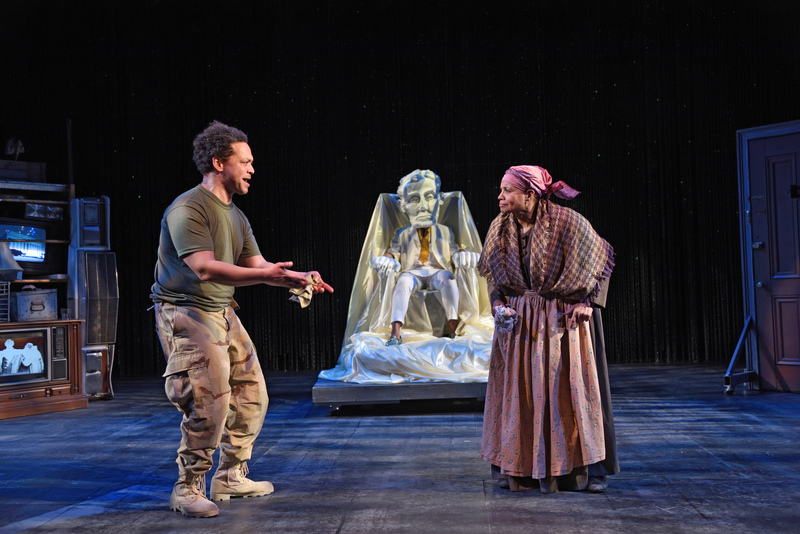 Left to right: Omar Robinson as Paw Sidin, Julia Lema as Aunt Tina, and Jude Sandy as Deus. Ulysses was lost at sea, so there are a lot of scenes with water, and rain. Poverty, oppression, despair, manipulation, aggression and greed seep through the lives of these characters and try to destroy them. Ulysses is dragged and dropped by the gods Paw Sidin and Deus from one pivotal historic moment to another, teaching him that who he is has been shaped by his ancestors. There is a trail of pain and betrayal. But there was so much love, too. It’s the emotion that seemed to catch my attention most often: love. Ulysses would be lost many times, but for the power inside him. He and his family have reservoirs of love, and hope, and pride, and stubbornness that never let them give up. Against the careless whims of the gods, Ulysses somehow continues to survive. He learns to reach back in time to his ancestors and to use their love for him to fuel his efforts. 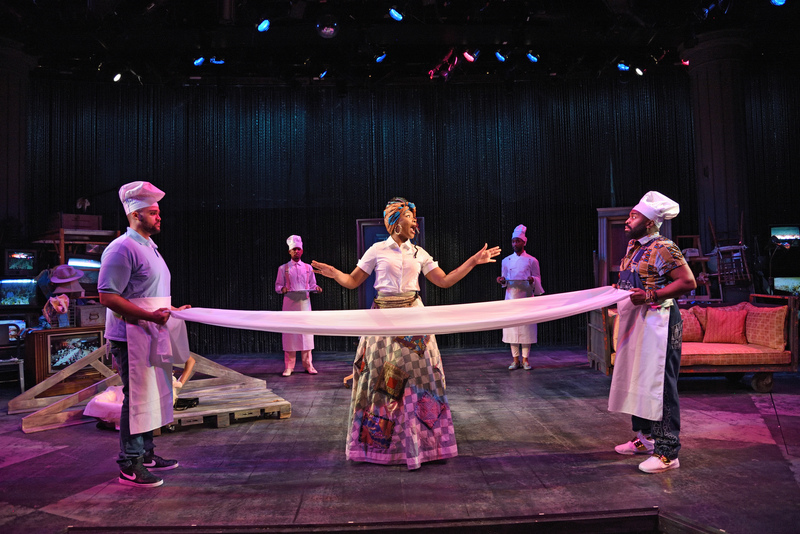 The central message in the play is that we are a product of our ancestors, even when we don’t know anything about them, and that we should use our ancestors as a source of strength. Another message is that our battles seem to be with outside forces, like gods playing chess, or the police, or the projects, but our theatre of war is actually within. Those battles need to be fought inside ourselves before the catastrophes on the outside can be resolved. Ulysses says, “We are who we have been waiting for.” That sentence was a jolt to me because I had already heard it in my own life, applied to me. At a Cherokee meeting two years ago, rapper Litefoot told us those exact words. The show’s opening chorus was not a standalone musical event, but rather ushered us into a performance filled with song. I wasn’t expecting all the singing, or what a great vehicle it is in this case to help tell the story. There were some fun scenes as Tina Turner, Diana Ross, and James Brown performed. We heard African-American and Afro-Cuban spirituals and chants, lullabies, work songs and civil rights anthems. Many were known to the audience and the actors persistently asked us to join in singing and clapping. Engaging with the actors helped to blur the wall between us, and I could not avoid yet another powerful impact of this performance, when I realized this story was about my path too. I couldn’t relate to Ulysses, but his journey – through all those ancestors – was beside me, and I saw my part in his story. I am not separate from him, and I need to know his story as well as mine. 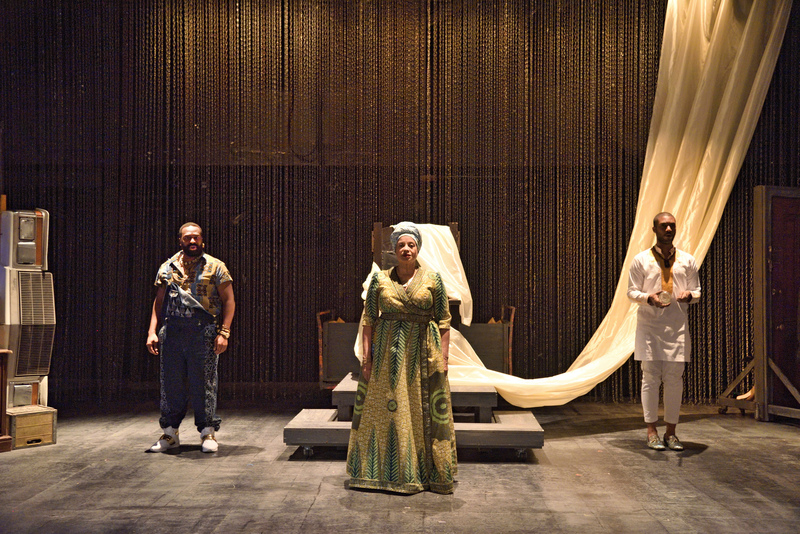 Joe Wilson, Jr as Ulysses, and Julia Lema as Calypso. Supa Fly Tiresias and his entourage. The play is intense. I cried. In fact, the end of the first act was such a shock to me that in the first minutes of intermission I numbly put on my coat and stood to leave, thinking it was over. Will had to snap me out of it. And the play is funny! It’s a delight of colour and texture and noise. It’s absolutely relatable. The costumes are out of this world. Will and I went crazy for the shoes. The SHOES! Ha ha ha. There’s a constant play on words for those of you who want a dozen little secret jokes. A couple of times the actors acknowledged someone in the audience who had become very engaged, and those moments made it more of an event than a show. Every single actor is outstanding. They play multiple roles that overlap, such as the actor playing Paw Sidin also plays John Suitor, who tries to lure Nella Pell (Penelope) away from her dedication to her missing husband. The actress who plays Benevolence (Nausicaa) was such a convincing 10-year-old that I tried and tried, but could not figure out who was playing her until the end! There is a happy ending. After the first, awful death, no other character dies. The gods leave Ulysses alone and are restored to good temper. For now.